(TORONTO - July 23, 2010) Provocative artist. Community builder. Deejay. Restaurateur. Activist. Inimitable party-thrower. Will Munro was all of these things and much more to many Torontonians, and the AGO is celebrating his life and work in the newest installment of the Gallery's Toronto Now series. Will Munro: Total Eclipse, on view from July 31 through September 26, brings together an intimate selection of Munro's multidisciplinary work, from hand-stitched quilted works on fabric, to slikscreens on mirror and paper, including original examples of the handmade posters Munro created to promote the many events he threw. The exhibition includes examples of Munro's many tributes to heroes of the queer, punk, disco, new wave, and performance art worlds, including representations of David Bowie and Klaus Nomi. Additionally, a media kiosk containing selections of video and performance work that inspired Munro's practice will be installed in the space, and includes clips from Paris is Burning, The Nomi Song, and Ziggy Stardust and the Spiders from Mars. "The works in Total Eclipse speak to Will's passion for music, performance, and pop culture, and reveal the keen interest in craft and do-it-yourself techniques in his artistic practice," says Michelle Jacques, the AGO's associate curator of contemporary art. "In his visual artwork, as in all of his many pursuits, Will brought together seemingly disparate individuals in a unique expression of creativity and community." An event to celebrate the exhibition's opening will take place on Saturday, August 7 in the Young Gallery and FRANK, the AGO's signature restaurant. Featuring DJ sets by Kevin Hegge and Adrienne Kammerer, the event will run from 8:00 through 11:00 pm and is open to the public. 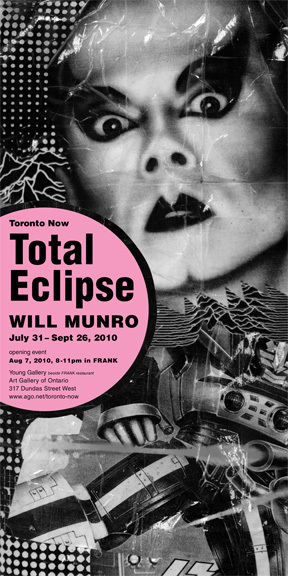 Will Munro: Total Eclipse is the third installment of the AGO's Toronto Now series of exhibitions featuring the works of emerging and established Toronto artists and located in the Young Gallery, the AGO's free, street-front gallery space. Allyson Mitchell will be the fourth artist featured in the series; her exhibition will open October 2. Toronto Now is generously supported by The Contemporary Circle. Contemporary programming at the AGO is supported The Canada Council for the Arts. Will Munro was born in 1975, and spent his childhood and teenage years in Mississauga. He attended the Ontario College of Art and Design, where he studied sculpture and installation. In 1999, he founded Vazaleen, a now-legendary series of dance parties. In 2006, he and Lynn MacNeil purchased the Beaver Café, now a hub of artistic and musical activity at Queen St. West and Gladstone Ave. Munro's visual art has been exhibited in solo and group exhibitions at venues including Art in General, New York; Mercer Union, Toronto; Art Gallery of York University, Toronto; and Paul Pertro Contemporary Art, Toronto. With a permanent collection of more than 79,000 works of art, the Art Gallery of Ontario is among the most distinguished art museums in North America. In 2008, with a stunning new design by world-renowned architect Frank Gehry, the AGO opened its doors to the public amid international acclaim. Highlights include Galleria Italia, a gleaming showcase made of wood and glass running the length of an entire city block along the Gallery's façade; and the feature staircase, spiraling up through the roof of Walker Court and into the new contemporary galleries above. 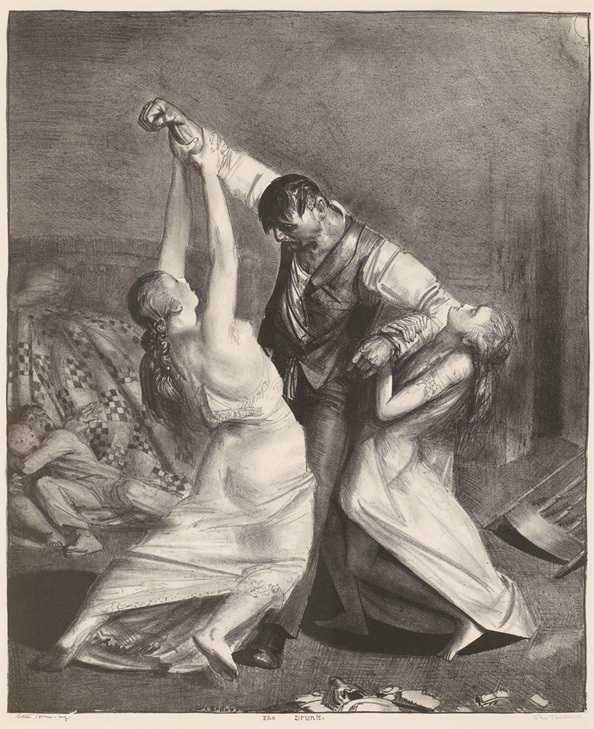 From the extensive Group of Seven collection to the dramatic new African art gallery; from the cutting-edge works in the Vivian & David Campbell Centre for Contemporary Art to Peter Paul Rubens' masterpiece The Massacre of The Innocents, a highlight of the celebrated Thomson Collection, there is truly something for everyone at the AGO.